Yosemite may not impress everybody instantly, until you are in the valley with massive granite cliffs peeping through the fog, or at Glacier point with an unnerving view of the valley, or watching the tallest waterfall in North America adorned by a rainbow in the afternoon sun, or wowed by the Giants of Mariposa grove. Yosemite national park is California’s most visited park, and most of the visitors limit themselves to Yosemite valley. To avoid the summer crowds we went to Yosemite in February, only to find a line of cars at the entrance to the park. Once inside, we realised it’s very easy to get away from the crowd; there are so many places to explore. We psuedo camped at the valley in the heated tent cabins of Curry village and decided to find out ourselves why this park excited so many people. Curry village is usually full for the weekends in spring and summer. Along with a few other options in the park there are many accommodations in the surrounding communities. First day evening, we went to Mirror lake (short hike). California drought was very evident at this place; though less water, place was pretty with reflection of Mt.Watkins and deciduous trees around. Second day, we hiked approximately 7 miles (roundtrip) to the top of Yosemite falls. The views were rewarding and we were slowly falling in love with this land of granite cliffs and waterfalls. On our way home we drove to the south of the valley to Mariposa grove of giant Sequoias and instantly realised why these trees are called ‘giants’. These are not the tallest nor the stoutest of trees, but they are the largest living things by volume. We checked out the Fallen Monarch, Bachelor & Three Graces, Grizzly giant, and California Tunnel tree, and felt like a tiny speck in front of these giants. Read about the famous drive-thru Sequoia of Mariposa here. Lookout for a snow plant (Sarcodes) if you are in the higher elevations of Yosemite in spring. This post is only gonna grow in the coming years, as we plan to explore Tuolumne meadows, hike Mt. 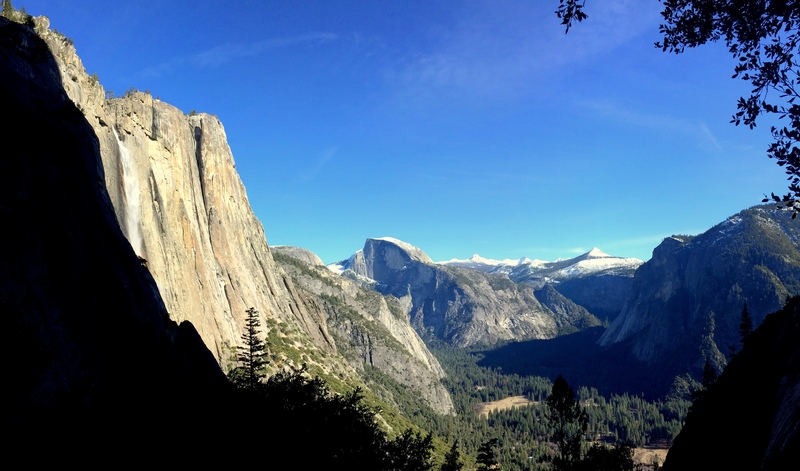 Dana, hunt for a snow plant, and see the magic of Yosemite in winter. For the more adventurous souls there is the Half dome hike. Thank you Deepika. Now, with all the snowfall in Yosemite, it’s a good time to go. Have fun!